When it comes to production and delivery of goods, “made to order” products and priority shipping are no longer exceptions to the rule—they’re becoming the norm. That puts greater demand on warehousing operations, whether you’re a third-party logistics (3PL) provider or managing your own inventory, parts, and finished goods. To keep up with those demands, smart warehouses (also known as “IoT warehouses”) are gradually overtaking manual ones. For some warehouses, that means automating back-end decisions and tasks. For example, the question of where to place an incoming pallet is made by a computer rather than a person. The computer makes the decision based on an algorithm, taking into consideration anything from how soon the material will be needed to how much of it will be needed. Once a decision is made (i.e., “put it close to the loading dock”), the computer might also provide directions on the fastest way to get there. Other warehouses, including many of Amazon’s warehouses, have turned over the bulk of manual work from employees to robots. While most warehouses aren’t even close to that point, many are likely feeling some financial pressure to make progress. There are several good reasons to employ the IoT in warehousing; take a look at some of them below. 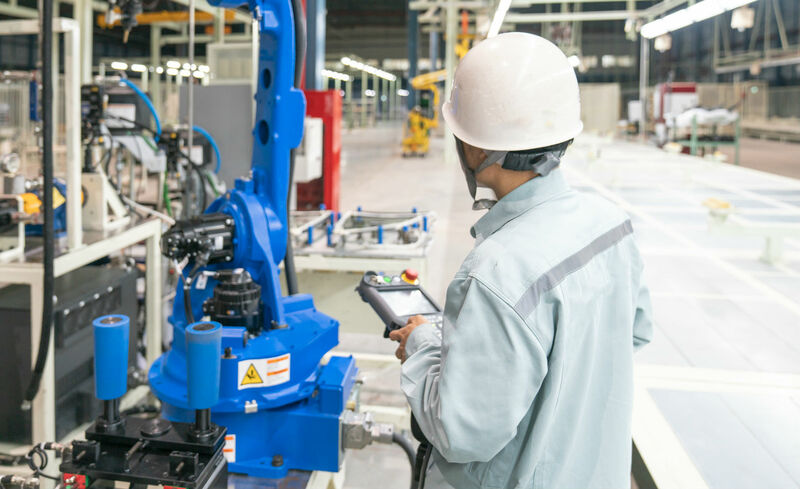 Looking for ways to take advantage of the IoT in your manufacturing facility? Download this white paper to find out about the low-cost solution many operations use to track and monitor materials. 1. Smart warehouses improve labor efficiency. The more you can automate manual tasks, the fewer employees you’ll need doing those jobs. And with labor costs on the rise, reducing that number alone can be valuable. But an even bigger benefit to smart warehousing is adding more value to the work your employees are currently doing. If things are moving more efficiently, people are able to do more work in the time they have. And with more of the manual tasks being automated, your employees will also able to shift their focus to more high-value tasks, optimizing your current workforce. 2. Smart warehouses enable faster turnaround times. Warehouses that utilize the IoT in warehouse management can respond quickly to orders, giving them a competitive advantage over companies with manual warehouses. For example, if you can efficiently automate tasks to ensure you give the most critical customer demands priority instead of using a traditional first in/first out system, you can improve the customer experience significantly. Warehousing could then become a value-add to the organization’s overall offering. 3. Smart warehouses increase warehouse transparency. The more your customer (or you) knows about warehouse inventory levels, handling procedures, temperature conditions, and more, the better and more valuable that warehouse is. But your employees can’t be everywhere all the time. Smart warehouse systems can overcome that challenge, with technology providing full, 24-hour visibility into operations, inventory, and warehouse conditions. That not only keeps you and your customers well-informed, but it also gives you more time to act when problems arise. 4. Smart warehouses improve scalability. The more your operations are automated the easier it is to expand operations to accommodate growth. Making adjustments to your technology is relatively quick compared to modifying your human capital, and less costly as well—for instance, you wouldn’t need to hire additional employees to meet an increase in operational requirements. Hand-in-hand with that is benefit #5. 5. Smart warehouses increase your adaptability. The more forward-thinking warehouses are in terms of technology and space utilization the faster they can adapt to demand shifts and process changes. Customers will increasingly be less willing to work with warehouses that are entrenched in their ways. Having a smart warehouse demonstrates your ability—and willingness—to adjust operations in response to changing demands. While the benefits of automation are clear, not every organization has the budget to implement a sophisticated smart warehouse system from the ground up. If that’s the case for you, it’s still possible to take steps toward using the IoT in warehouse management without going full throttle. One of the best ways to get started is by introducing location technology into your operations. Having accurate information on the location and availability of a particular product or material within the warehouse helps you respond to orders faster. Location information helps create optimal routes for faster movement around the warehouse. 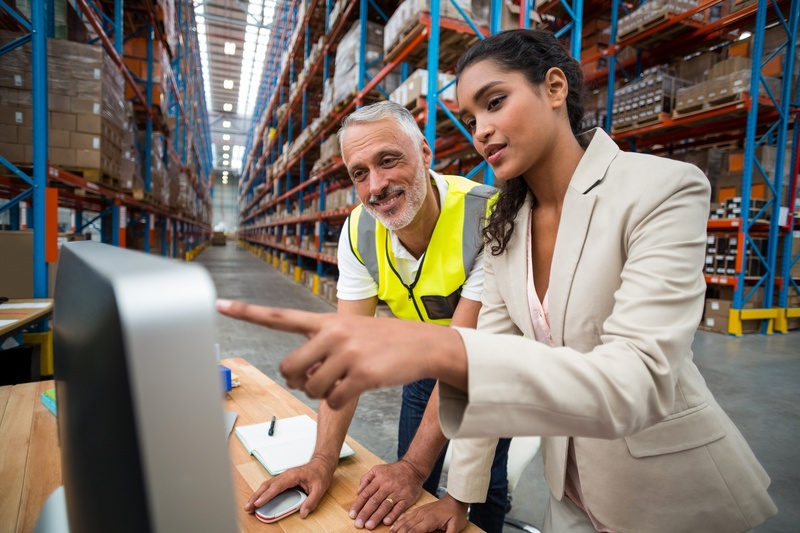 Having greater visibility over your warehouse operations includes knowing if certain items are present or absent and helps avoid out-of-stock conditions; it also enables you to keep customers apprised of items arriving or leaving the warehouse. Location intelligence helps promote optimal warehouse setup, so that fast-moving items remain in priority areas and slower-moving products remain in other areas. Location technology doesn’t have to break the bank—or have extensive installation and infrastructure requirements. Start simply with AirFinder. AirFinder offers simple and effective real-time location tracking for warehouses at a fraction of the cost of many alternatives. It consists of a network of Bluetooth proximity beacons installed in locations where you need to know which equipment, materials, items, or staff are nearby and low-cost iBeacon tags affixed to moveable assets. Using Bluetooth Low Energy (BLE) technology, the proximity of the tag to the beacon is relayed back to the central access point. Your assets’ location is available for you in real-time. AirFinder is an active RFID (radio frequency identification) technology as opposed to passive, which means it’s a great way to not only confirm the presence of a tagged item within an area (as passive RFID does) but also tell its location. Active RFID technologies are attractive because of their low cost, high scalability, and long battery life. And because active RFID tags regularly transmit their locations, you’re far more likely to get an accurate reading. Keep in mind, however, that active RFID cannot provide pinpoint accuracy, so if that’s what you’re looking for, you may need to start with a more expensive technology, like ultra wide-band (UWB) real-time location systems. If you’re interested in finding out more about how AirFinder’s low-power, long-range communication system can help your warehouse with location tracking, talk to us. How accurate does your asset tracking system need to be? What Does A Connected Factory Look Like? Copyright © 2019 Link Labs, Inc. All Rights Reserved.